Singapore Index Fund is an open ended equity indexed mutual fund launched and managed by Singapore Consortium Investment Management Limited. It invests in the public equity markets of Singapore. The fund seeks to replicate the Straits Times Index by investing in weighted proportion. It was formerly known as Singapore Regional Index Fund. 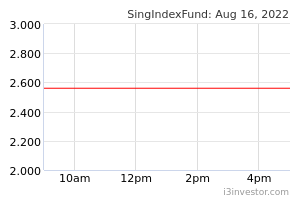 Singapore Index Fund was formed on December 18, 1996 and is domiciled in Singapore.